How do I cluster Liferay with Terracotta? Next step is to install Liferay and Terracotta. For the purposes of this post I won’t go into great detail with the installation as both Terracotta and Liferay has good documentation. Basically the installation consist of unpacking the packages to a directory. From now on I will refer to those locations as LIFERAY_HOME and TERRACOTTA_HOME and inside LIFERAY_HOME we will have tomcat directory which I will refer as TOMCAT_HOME. Normally you would also install Liferay and Terracotta in separate servers but I will post a separate post addressing the recommended architecture. For now we can install everything on the same machine and run Terracotta with default configuration for development purposes. Normally when clustering Liferay you need to address following components: EhCache and Hibernate, Quartz Scheduler, Document Library, Search Engine and optionally Session Replication. For Document Library and Search Engine Terracotta doesn’t offer anything new so you make those centrally available the same way as before. For example SAN for DL and SOLR for Search and Indexing. So we are left with EhCache and Hibernate, Quartz and Session Replication that we can address with Terracotta. Create a hibernate-terracotta.xml and a liferay-multi-vm-terracotta.xml. This is highly container specific so refer to Terracotta documentation for specific instructions. Following steps are for Tomcat 6.0. 2010-09-01 21:35:40,566 INFO - Successfully loaded base configuration from server at 'localhost:9510'. Now browse http://localhost:8080 to verify that your portal is running. 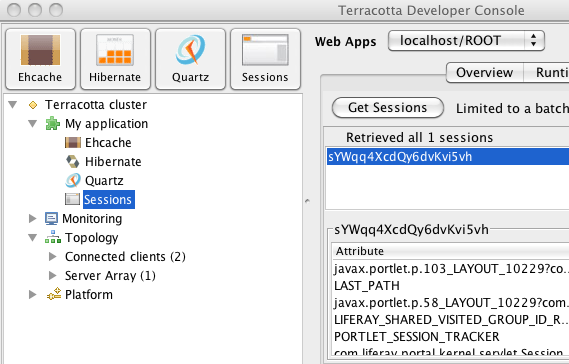 Once you are connected to your Terracotta you should see Ehcache, Hibernate, Quartz and Sessions under My application which indicates that all of them are connected and recognized by Terracotta. Now you can use Dev Console to see what’s inside your cache or session. Now as you can see it is quite easy the cluster Liferay with Terracotta express installation. Now if you want to use the DSO approach it is whole another beast as it involves tedious instrumentation. If you are a Liferay EE customer and want to get supported version of both Liferay and Terracotta contact your Liferay sales rep and ask about Liferay Terracotta Edition.